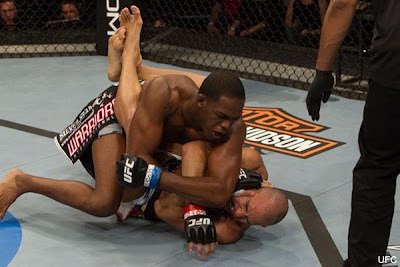 DSTRYRsg: Destroyer Submission Grappling and Brazilian Jiu Jitsu: Fighters FAIL Guard at UFC on Versus. Fighters FAIL Guard at UFC on Versus. Vera TKO'd While Playing Guard: I don't know too much about Brandon Vera's BJJ skill/credentials, but Joe Rogan was speaking very highly of them just before Jones broke Vera's face with a brutal, fight-ending elbow from inside Vera's guard. 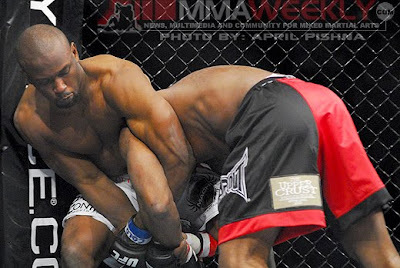 Vera did look like he was trying to set up some sort of armbar or triangle from guard. Random Undercard Guy KTFO'd While Playing Guard: I'm not familiar with either fighter, Daniel "Ninja" Roberts or John Howard - their fight was pretty deep in the under card. Unfortunately for Roberts, it was televised (i.e., as a gap-filler prior to the main event). Although Roberts, who claims 12 years of jiu jitz on his website, showed some impressive grappling skills at the outset, he ultimately got knocked out cold in Round 1 while laying on his back (Howard standing at Roberts' feet/hurling a left punch). Worse, he showed no ninja skills whatsoever. Roberts showed some us some grappling skills ... for about 1 minute. Clay Guida Grabs a Submission from Full-Mount: This is just a freakish rarity, and it's too bad it wasn't televised. Guida apparently took full mount and ended the fight against 12-5 fighter, Shannon Gugerty, with an arm triangle choke. After the fight, Guida said he didn't think he'd ever tried the submission in practice. Probably not much a challenge for Guida, but I'll take this as a clear and decisive victory for jiu jitz. Don't forget Jiu-Jitsu is not just the guard, it incorporates top game, passing,transitions and if your playing Jiu-Jitsu in MMA it better incorporate good positioning with ground and pound. If your still doing jiu-jitsu just to submit in MMA your in for a rude awakening because with those mma gloves it is much harder to to get your hands through the holes to pull them off. If you can pull off a submission that is great, but most likely your better off to have good ground transition and pound your opponent till he quits. Good points. I agree. As MMA evolves and the athletes become versed in all aspects of BJJ/catch wrestling/submission grappling/etc., it will be harder and harder for even the best grapplers to achieve stunning sweeps and submission in fights. I think anonymous is kind of stating the obvious. Of course in an MMA fight you'd rather be on top. Of course its tougher to pull off subs when a guy can hit you and while he's slippery and wearing gloves. But hanging out there passively will get you pounded out. Better to blatantly force a triangle or armbar attempt and risk a guardpass if you miss. Most jits guys should be able to turn that into a scramble. I'd take the odds in that scramble over just hanging out there flat on your back while a guy pounds you out in your guard.